President Trump and first lady Melania Trump opened the annual Easter Egg Roll at the White House on Monday where they're expected to host hundreds of families for springtime-themed activities and readings of classic children's books on the South Lawn. Mr. Trump kicked off the day's events by thanking the first lady and the White House Historical Association for organizing the annual festivities. He said his family has helped keep the White House in "tippy top shape." He also took a moment to tout the administration's impact on the country's economy and boost in funding the nation's military. "Our country is doing great, look at the economy look at what's happening," said Mr. Trump. "Nothing is ever easy but we've never had an economy like we have right now." When chatting with children, the president was asked by reporters if DACA recipients should worry about their future after his morning threats that a DACA deal was "dead." "The Democrats have really let them (DACA recipients) down," said Mr. Trump. "They've really let them down, they had this great opportunity, the Democrats have really let them down it's a shame, and now people are taking advantage of DACA and that's a shame. Should have never happened." Mr. Trump spent part of his Easter Sunday tweeting that he would no longer support a deal on fixing the Obama-era Deferred Action for Childhood Arrivals (DACA) program and threatened to pull out of the North American Free Trade Agreement (NAFTA) if Mexico doesn't step up border security. He later attended Easter Sunday services at a local church in Palm Beach, Florida, where he again blamed Mexico for doing not doing enough to stop the flow of people and drugs into the United States. He added that Democrats had a "great chance" on delivering a fix to DACA but that they "blew it." 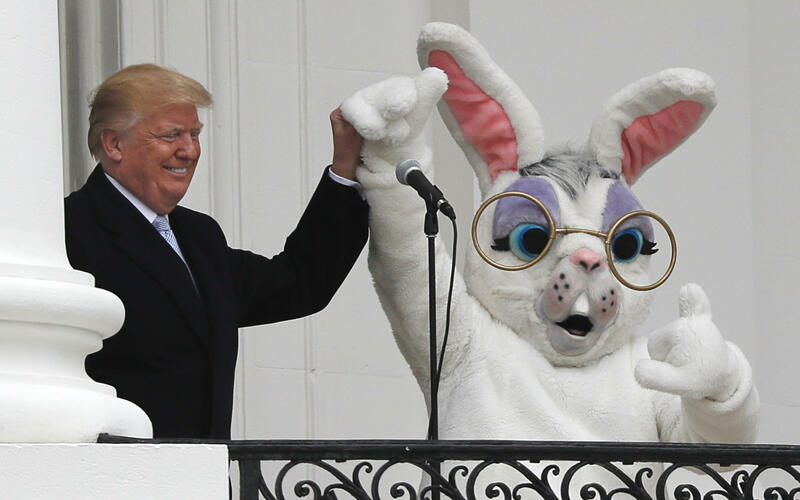 Following his remarks, the president and first lady, standing beside their song Barron, provided the first official whistle blow for the Easter egg roll races on the South Lawn before greeting young visitors. Mr. Trump's two eldest sons, Eric and Donald Jr., both were seen in the audience with their children as well as Mr. Trump's daughter Tiffany. Members of the Trump administration including White House Press Secretary Sarah Huckabee Sanders, adviser Kellyanne Conway and Education Secretary Betsy DeVos are slated to read stories to children at Monday's event.